Lemons and limes are essential in the kitchen, especially at this time of year when citrus fruit is at its best. As well as the juice being so versatile, the zest contains fragrant essential oils that add a distinctive citrus note. While cooking, the mixture for these puddings separates and the juices form a thick, curd-like sauce beneath the sponge. Preheat oven to 180°C, gas mark 4. 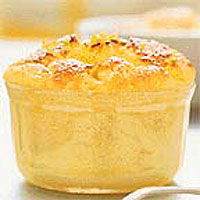 Grease 6 x 250ml ovenproof cups or ramekins and place on a baking sheet. Cream the butter and 100g of the sugar until pale and fluffy. Whisk in the egg yolks one at a time. Pour the juice from the lemons and limes into a measuring jug and make up to 150ml using either more juice or cold water, if necessary. Gradually whisk the juice into the mixture - don't worry if it looks slightly curdled. Whisk in the milk, then sift the flour over the top of the mixture, whisking well. Fold in half the grated lemon and lime zest. Cover the remaining zest and set aside. Whisk the egg whites for 3-4 minutes until soft peaks form, then gradually whisk in the remaining sugar. Fold the egg whites into the mixture until evenly incorporated. Divide into the prepared ramekins and cook for about 20-25 minutes until the tops are risen, set and slightly golden. Remove from the oven. Dust with icing sugar and serve, decorated with the remaining lemon and lime zest. These puddings are also delicious served cold with a spoonful of whipped cream. You could make one large pudding in a 1-litre ovenproof dish. Cook for 40-45 minutes. This recipe was first published in February 2002.